Betula alleghaniensis tree. 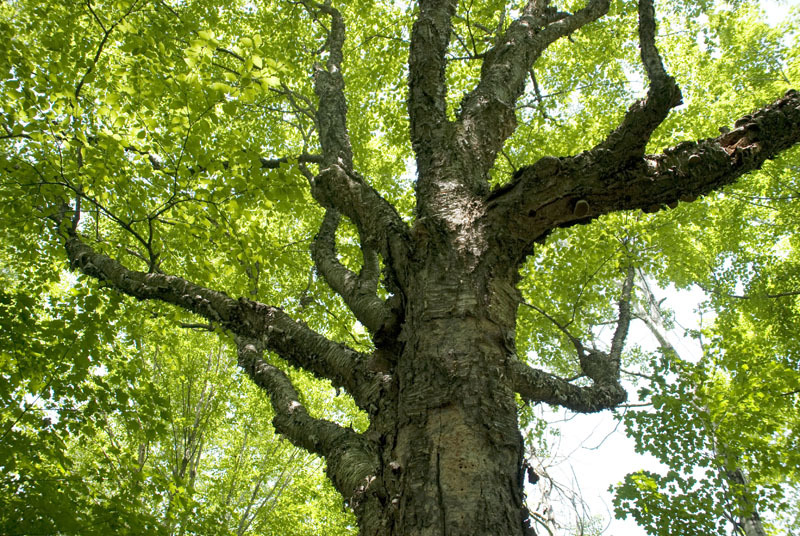 Trees, insects and diseases of Canada’s forests. Natural Rescources Canada. Government Canada. tidcf.nrcan.gc.ca (Accessed 10/2017). Betula alleghaniensis is a tree to 30 m tall, bark shiny, yellow-silvery-gray, peeling in thin, filmy strips, appearing shaggy; old bark dark, rough; crushed twigs slightly aromatic, of wintergreen. Leaves alternate, (sometimes paired on short twigs) egg-shaped, to 10 cm long, coarsely, tip pointed, base rounded (to slightly lobed), veins below softly hairy, margin sharply toothed. Betula alleghaniensis male catkins. © naturalmedicinefacts.info 2015. naturalmedicinefacts.info (Accessed 10/017). 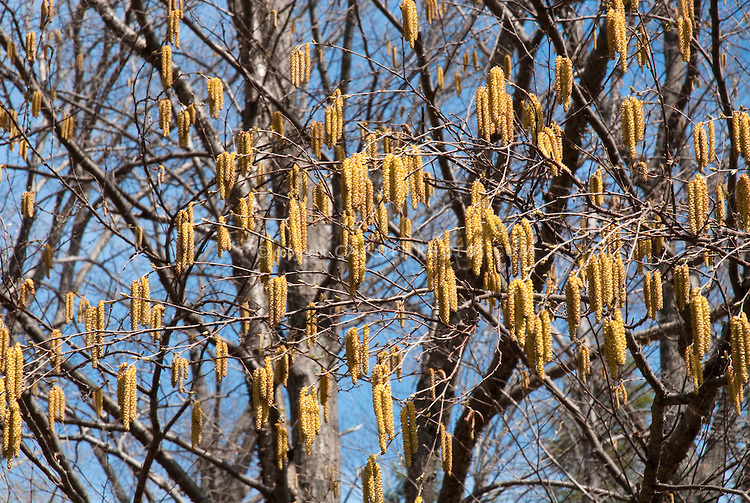 Flowers: monoecious (male and female flowers separate on same tree), tiny, in catkins; male catkins elongate,the individual flowers tiny, between scales, pollen wind dispersed; female catkins oval, 2-3 cm long flowers between scales; blooms May-June. Betula alleghaniensis. 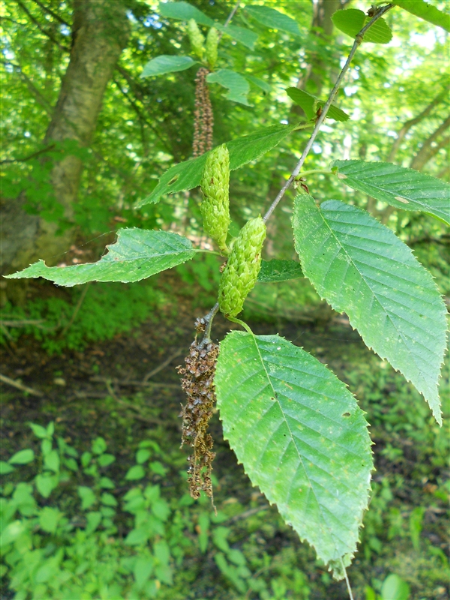 unripe fruit, leaves and old male catkins. L. Wallis. Herbarium University of Michigan. michiganfrlora.net (Accessed 10/2017). Fruit: Female catkins to 3 cm long, hairy to 0.4 cm wide, of circular winged nuts amid scales; ripen Aug.-Sept., wind dispersed; Sept.-Nov. Seeds, buds and catkins eaten by a few birds and small mammals (Martin et al. 1951). Habitat: Moist woods. Soil pH 4-8 (USDA, NRCS 2010). Notes: Twigs eaten by deer and rabbits (Martin et al. 1951). Susceptible to Nectria canker (Nectria galligena, Hypocreaceae; Ascomycotina) with red, bead-like fruiting bodies and Armellaria mellea (Basidiomycotina) shoestring root rot, causes decay of roots and base (Burns & Honkala 1990; Agrios 1988).